In honor of Veteran's Day this year, I thought it might be nice to pay tribute to a veteran I'm very familiar with. In fact, I wrote a book about him. I can honestly say that I've never heard a more compelling story than the Major A.G. Happer story. There are of course, many great stories about Civil War veterans, but I've never seen one that matches this in either scope or depth. It truly is the quintessential American story. I will share here, a brief outline of some of the more memorable events in the life of Major A.G. Happer. Not meant to be complete, but merely some highlights of a truly remarkable American's life who should be remembered on this day of all days. It's a rather lengthy post, but worth the time. The facts and events included in the book have been thoroughly documented during the four years of arduous research performed by the author. A.G. Happer was born into a family with an already remarkable record of service. First arriving in America in 1787, the Happers settled in Union Township, Washington County, PA. Operating a large and thriving farm, they proceeded to go about the business of agriculture. Over time, the family grew into a large and prosperous family, many of whom left the farm and spread across the entire country, to embark upon various ventures. Others traveled to China, Japan, Hawaii and other south Pacific islands as missionaries. Each in his own right became someone of consequence in their chosen area. All of them were heavily involved with service to their community. The Happers who stayed home carried on the family trait as well and were Elders in the Mingo Creek Presbyterian church where the Whiskey Rebellion conspirators met, along with many other community activities. A.G. Happer’s father, John Arrell Happer was born on the family farm in 1816. Involved especially in the raising and breeding of livestock, after attending Jefferson College he became a “Gentleman Farmer” and was on the local school board for many years, an Elder in the Mingo Creek church, and a pillar in the community highly respected by all accounts. He also served in the State House of Representatives at the start of the Civil War. He married Violet Gardner and they had eight children, the oldest being Andrew G. Happer. He was born on the family farm on August 15, 1839 and Andrew enjoyed being close to the land as had his father and grandfather, and planned a life in agriculture. An excellent student, he was an active participant in the affairs of his church, another interest that would last all of his days. In 1859 he enrolled in what was then Washington College in Washington, PA. He was well aware of the accomplishments of his ancestors and family members and knew that much was expected of him. His education was to come to a halt however with the firing on Fort Sumter. A.G. Happer enlisted in the 1st Volunteer Cavalry where he served until their enlistment expired. He then enlisted as a First Lieutenant in Company G of what became the famous 11th Pennsylvania Volunteer Infantry, known as “The Bloody Eleventh.” Happer arrived on the field near Warrenton, Virginia leading a 50 man detachment of Co. G. and went right into action at the battle of Thoroughfare Gap where they were in front of the Brigade sent to delay General Longstreet’s advance. Happer & the 11th then were positioned on the Federal left at the resulting battle at Second Manassas receiving the massive attack of General Longstreet’s flanking assault. Present again at the battle of South Mountain, Lt. Happer helped lead his company with skill and bravery. Arriving at Keedysville Maryland on September 16th, 1862, the 11th Pennsylvania was poised to participate in the bloodiest day in American history. The following morning, Lt. Happer and the 11th PA charged headlong into the famous Miller’s Cornfield at the Battle of Antietam. One of the most deadly places in the entire Civil War, Lt. Happer fought a 30 minute stand up battle against the famous Louisiana Tigers. Happer was wounded but remained with his men and only retired when their ammunition was exhausted. Lt. Happer was then present and engaged in the Union left at the battle of Fredericksburg, where they attacked the Confederate Second Corps led by Stonewall Jackson. At the battle of Chancellorsville, the 11th with Lt. Happer was positioned on the far right of the Union position. They were ordered to provide security on the far right, beyond the right of General Howard’s troops and did so. They were the last troops to retire in that Union defeat. On July 1st 1863, Lt. Happer was marching northward with his Regiment through Maryland and into Pennsylvania. They were ordered to march with all speed to the Gettysburg area. They were positioned near the Seminary at first to stem the Confederate advance, but were then ordered eastward to Oak Ridge to deal with another Confederate attack. Positioned along the Mummasburg Road, the 11th waited along a stone wall while the Confederate Brigade of General Iverson approached. They sprang up and delivered a devastating volley that decimated that Brigade. Lt. Happer & his men then leaped over the wall and captured several Confederate battleflags and about three hundred prisoners. Further fighting on Oak Ridge until overwhelmed by superior forces, Happer with the 11th were ordered to retire to near the railroad cut in support of Stewart’s Battery which they did until ordered to retire to Cemetery Hill. The following day, Lt. Happer and the 11th were positioned in reserve at various positions along Cemetery Ridge during the Second Day’s fighting. They suffered numerous casualties from Confederate artillery. The third day at Gettysburg, the 11th was positioned just north of the famous Copse of Trees. Although positioned near the rear, they saw action in the horrendous fighting during Pickett’s Charge. Lt. Happer survived the carnage of Gettysburg unscathed, but his luck would not hold for much longer. The good news was that Lt. Happer was promoted to Captain of Company I of the 11th PA.
On May 5th 1864, at the Battle of The Wilderness, Captain Happer and the 11th Pennsylvania leading General Baxter’s Brigade slammed into Confederate General Dole’s Brigade of Virginians stopping their advance. As night fell, the 11th was ordered to the Federal left in support of General Hancock’s Second Corps. The following morning, the 11th PA advanced forward driving the Confederate infantry of McGowan’s Brigade back through the dense tangle of woods to the Tapp farm. This is a very famous moment in Civil War history. As General Lee’s troops were being driven back, he attempted to gather his fleeing men and rally them. He then tried to actually lead them personally forward into the deadly fire from the Union troops across the open field and into the woods beyond. His men were able to stop him by holding his horse’s bridle. Just then, General Longstreet’s Texas Brigade appeared and advanced forward. In those woods beyond, was Captain Happer. In moments, he was seriously wounded low in the abdomen. As the Confederate advance pushed back the Union troops, Happer was left for dead on the field. Unable to move or stand, he laid there in agony with a broken pelvis for three to four days. He was miraculously rescued by a slave who brought water and washed Happer’s wounds. He was able to get Happer to a Confederate field hospital. Nothing could be done, it being feared the wound was mortal and Captain Happer was made as comfortable as possible and laid on the ground. Surprisingly, Happer didn’t die after all. He was sent to Richmond to Libby prison where he spent an agonizing six months, unable to even sit up to receive proper nourishment. Finally, Happer was released and taken to the docks in a wooden cart and dumped onto the deck of a steamer bound for Annapolis, Maryland. Captain Happer spent the next few months recuperating at Camp Parole. It was a miracle he survived his wound, but survive he did. Still recuperating, he was able to be assigned to light duty in the Mustering Out Office in Harrisburg, PA. He also served on the Court Martial Board as well. On April 14th, 1865, President Lincoln was assassinated. It was decided that the President would return home to Illinois by a special train, the “Lincoln Special.” The train would travel from Washington to Baltimore to Harrisburg, then on to Philadelphia, New York and so on, all the way home to Springfield. The Governor of Pennsylvania, Andrew Curtin selected Captain Happer as one of his personal entourage to accompany him on the train. They boarded the train at a non-scheduled stop as the train arrived at the Pennsylvania \ Maryland border. The Lincoln Special arrived in Harrisburg about eight p.m. Friday April 21. The coffin was then carried by hearse to the state House of Representatives, and opened for public viewing at 9:30 p.m. The next day, at 11:15 a.m. the train pulled out of the station with Captain Happer on board for the long trip to Philadelphia's Broad Street Station, then on to Independence Hall. The coffin was placed there in the east wing where the Declaration of Independence was signed. Happer remained with Lincoln until the train left Pennsylvania on April 24th then he returned to his duties in Harrisburg. For the rest of his days, Happer said this duty was the greatest honor of his life. Not long after this, on October 20, 1865 Major Happer was finally mustered out of the service. The war, was over. Major Happer returned home and slowly recovered from his wounds. After a short stint as the Assessor of Internal Revenue, he opened a small insurance office on North Main St. in Washington, PA in 1871. It wasn’t long before Happer made his presence felt. In October of that year, the Great Chicago Fire occurred. Happer led the drive to raise funds, food and clothing for the victims. He sent wagon loads of supplies and several thousand dollars to the affected areas. His business grew and he branched out into real estate as well. In 1877, he married a local girl named Matilda Watson. She was the daughter of prominent attorney James Watson. Around this time, Happer who had always been interested in the welfare of children, became aware that the Pennsylvania House of Refuge in Allegheny, PA was closing. Happer saw the opportunity available and moved the reform school to Washington County at the former Revolutionary War Colonel George Morgan’s estate “Morganza.” Instead of being merely a reform school, Happer’s vision included a main building, a girls department, a boys department, a church, and workshops. More focused on education than punishment. Happer served as it’s President until his retirement in 1911. Grand Army of the Republic Post 120 was formed in 1879 and Major Happer was a member in good standing for the rest of his days. 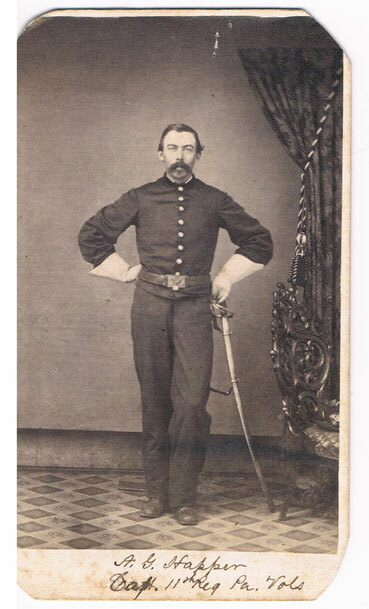 He also served in Company H of the Pennsylvania National Guard and was it’s Adjutant in 1879 and 1880. Throughout his life, The Major was interested in all things agriculture. He was a member of the “Washington Society for the Promotion of Agricultural and Domestic Manufacture in Washington County.” Happer was their Treasurer for many years. The Western Pennsylvania Agricultural Association was formed in 1885, and the Major was instrumental in getting that one started, and was a member for the entire length of it's existence. They purchased grounds for their fair, and by all accounts were the best in the state. The fair was successful for years but became more of an annual horse racing event. As the founders aged, the fair went into decline and the last one was held in 1901. By this time the Major’s real estate business was the largest in the county. He had already developed several large parcels including Kalorama, and Woodland. He needed other sources for funding. In the summer of 1885, Happer brought in a few of his real estate associates along with their family and friends to start the Citizen's National Bank of Washington, Pennsylvania. Their opening capital was $100,000.00. The Major wasn’t interested in the day to day operations of the bank, so he turned that over to his friend John Donnan. Happer served on the Board of Directors. The bank was very successful and was the largest bank in Washington and was in operation until being bought by Mellon Bank in 1948. Happer was also a founding member in The Washington Trust Company where he also served on it’s Board of Directors. With all the development happening around Washington, the Major was well aware of the need for an increased water supply. The larger cities in the east were moving to a centralized water supply system. Happer figured that his town had to change with the times, and now was the time to get started. In December of 1885, Happer, along with T. F. Birch, B. M. Clark, John R. Kuntz, and Harry Chambers applied to the Governor for a charter for The Citizen's Water Company. The charted was granted in January 1886. After building a reservoir, pumping station and a main line, pipe was laid in the city, and on December 1, 1888, the lines were filled with water for the first time. Customers were signed up at a rate of $4.00 per year. While it lasted, Washington County was the epicenter of oil and natural gas exploration in the world, and produced more oil and gas than anywhere else. Oil was shipped all over the east, most of it was bought by the Standard Oil Company, owned by John D. Rockefeller. The boom lasted about twenty years, and when the famous Lucas gusher at the Spindletop strike happened in Texas on January 10, 1901, and the oil boom moved west. In 1884, the Wheeling Oil Company was formed and Major Happer was one of it's directors. Already being in the real estate business made it a natural add on for his company. He had the expertise and contacts to acquire oil leases throughout the area. There were oil wells on the Happer farm, and on other family members' properties. By 1888, Happer was ready for much larger real estate projects. He purchased the Wearer farm, which he eventually renamed West End. This development went so well, that he continued on with several others. Eventually, he was able to purchase some more Morgan property. This was “family business,” since Happer's wife was a great granddaughter of Revolutionary war Colonel George Morgan. In any event, the sale went through and they platted the land with the temporary name of Morgan Addition to East Washington. The land was subdivided and sold, on the lots were built stately Queen Ann style Victorian homes, many of which still stand today. The area then became it's own Borough known as East Washington. It eventually had it's own elementary and high schools, and it's own police department. This new borough owes it entire existence to the forward thinking of A. G. Happer. The Major was far from done. The Washington area was also sorely in need of commercial development. With new partner John K. Donnan, along with James Kuntz Jr. and several others, they were able to buy the 220 acre Gordon farm. The divided it into 1,500 lots which quickly filled with some of the top manufacturing companies in the area. The country was changing, modern times were here. It seemed that new inventions were popping up every day. One new idea that interested the Major was Alexander Bell's new toy, the telephone. It was going great guns in most major cities, and by 1883 Happer thought that Washington should have it too. Along with H. U. Seaman and Robert Wolfe, Happer pushed for an exchange to be opened in town. Finally on October 1884, the first Central office was opened in the Briceland building on West Wheeling Street, and Jennie Rogers was the first operator. The Major of course was one of the first customers and his phone number was 26. Major Happer continued to sell insurance and real estate, develop land, drill for oil and gas and be involved more and more in public projects that were of benefit to the whole community. There was indeed, one huge piece missing. Those in need of serious medical treatment were required to travel to Pittsburgh, or somewhere else. There was no hospital in Washington. In the late 1870's Doctors Harry and Thomas McKennan along with Dr. Grayson led the charge to start a hospital. They succeeded at least for a short time. They were able to open a hospital in a house on North College Street, but due to lack of funding and interest, it soon closed. Miss Nellie Reed, tried to drum up interest a few years later by putting on shows at the town hall. A “series of entertainments” they were called. She was able to raise only a few hundred dollars however, and soon gave up. She left the money raised in the able hands of her relative, Major Happer, to hold until such time as interest could be revived. In early 1897, three physicians renewed the call for a hospital. This time however, the Major jumped on board with several others and wouldn't let the idea die. A charter was granted to Washington Hospital. There was to be a board of directors to run the hospital. The first order of business was to secure a building. The board had no money to either build or purchase one. It was decided to purchase the A. W. Acheson homestead on Acheson Avenue for $10,000. The Major used the money left in his care as seed money and with several other men, advanced their own personal funds to purchase the building, Happer advancing the majority of the funds. The Washington Hospital opened in May of 1898. It was very small, only twenty beds in all, with no real operating room. Surgery was performed in a spare room. Individuals and institutions were allowed to establish rooms for public use that they were responsible for maintenance and upkeep. They had their names painted on the door. There was a door with the name Watson-Happer. Major Happer served on the Board of directors and was active in the management of the Hospital for many years. As we've seen, the Major was very active in community affairs for all his adult life. There is one that hasn't been mentioned, his church. When Happer moved to Washington, Pennsylvania for good in 1871, it was no accident that when he had achieved sufficient success, he built his “magnificent house of Cleveland stone” right next door to the First Presbyterian Church. The Happers had been for generations heavily involved with the Mingo Creek Presbyterian Church. In fact, most of them are buried in the cemetery there, near Finleyville. The Major, however, threw in with the church next door. For over forty-five years he was a member there, forty years the leader of the choir, and a trustee for over twenty-five years. He would be absent from church services or choir practice only due to illness. The new century brought little change for the Major. He continued on with his real estate and insurance business. He continued to be involved with the improvements to the city and county. The only thing lacking in his life were the blessings of children. He and Tilly never had any children of their own. The Washington centennial celebration in 1910 was a grand affair. The Major was getting a little older now, but he was still a vigorous man, and kept busy everyday. In 1911, at age 72, he retired as President of the board of directors of the Morganza Training School. He still served on the board of the Washington Hospital and was actively managing its affairs. He was still involved with the agricultural community as well. He still served on the boards of the Citizen's Bank and the Washington Trust Co. The GAR still counted him as a member in good standing. It must be remembered that Happer accomplished all he did, still carrying the Confederate bullet from the wound he received at The Wilderness. The Major passed away on April 27, 1915 at the age of 75. This story doesn't begin or end with the major. His family members and descendants proved to be as civic minded as he was. Many were heavily involved with the major players in the industrial development of America, such as Andrew Carnegie. The story spans the time frame from the Whiskey Rebellion, the Civil War, the Great War, WWII, and Viet Nam. Happer descendants were instrumental in many of the major events in modern American history from the purchase of Alaska, Dr. Salk's Polio vaccine, the D-Day invasion, football coach Knute Rockne, the Kennedys, LBJ and much more. At no time did the Major ever seek credit or glory for either his Civil War service or his service to his community. Nor did he never stamp his name on any of the improvements to the city as he could easily have done. His only interest was in getting the job done. During four years of rigorous research, I never once found any inkling of so much as an unkind word about the Major. He was universally loved and respected by all who knew him. He was a man of character who did the right thing, even when no one was looking. As a consequence of that, he never received the credit he so richly deserves and sadly has been forgotten, while his employees and associates did in fact receive much credit. There is no doubt in this author’s mind that Major A.G. Happer would be perfectly fine with that. However, the time has come at long last for Major Happer to receive the recognition of the State he sacrificed for, and the community he served so well, and for so long. Major events are currently taking place in Washington, PA to finally recognize the service of one of their own. I'm proud to have been the one who brought all this to light so that justice could finally be done. Please checkout my Facebook Author page for more details.